#DCeaglecam Watch: Bald Eaglet May 'Pip Out' In D.C. Tuesday : The Two-Way The parents, known as Mr. President and The First Lady, have been incubating two eggs at the National Arboretum, and a baby could emerge soon. Eagles known as "Mr. President" and "The First Lady" have been incubating two eggs at their nest inside the National Arboretum. A mated pair of bald eagles that have nested in the U.S. National Arboretum since 2014 are now starting a family, taking turns incubating two eggs — and one of them could hatch sometime Tuesday. Two webcams are currently trained on their nest in Washington, D.C.
You can watch the webcam online — we'll note that the American Eagle Foundation warns, "This is a wild eagle nest and anything can happen." What we're all hoping for is that first "pip," the sign of a baby bird trying to break through its shell, followed by a successful emergence. The two eggs were laid on Feb. 10 and Feb. 14; on Twitter, egg-watchers have been using the #dceaglecam hashtag to follow the nest, and to guess when that first egg will hatch. "This is the first Bald Eagle pair to nest in this location since 1947," the foundation says. 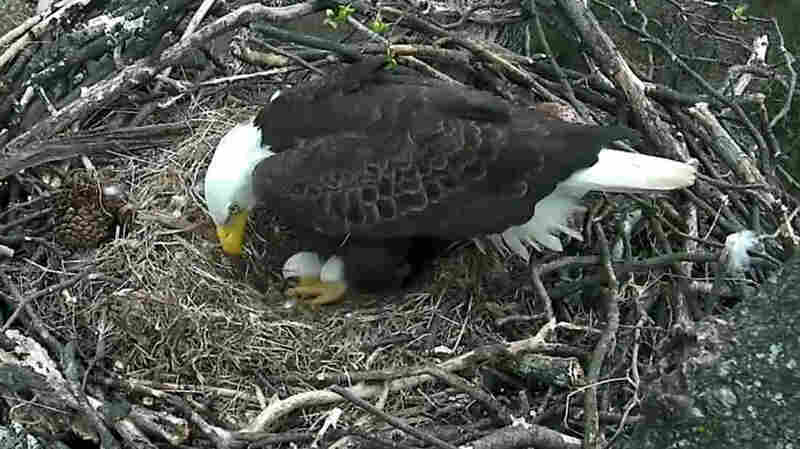 It adds that the two eagles have been dubbed Mr. President and The First Lady. If both eaglets emerge and remain healthy, they would continue a streak of success for their parents, who raised one eaglet last year at the National Arboretum, a 446-acre green space and research facility that's about two miles northeast of the Capitol building.